Learn how to save tens of thousands of dollars on your new home with these money saving tips. 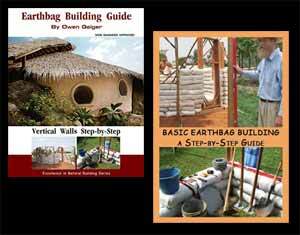 Lots of people ask us how much their earthbag or strawbale house will cost. Cost is a major consideration of any new home, and so it’s understandable why people want to learn more. However, many people don’t realize how many variables are involved. It’s the old “how long is a piece of string” question that makes it very difficult to answer. The following examples will help clarify what I mean. As you can see there are lots of variables. Plus, prices vary from one store to another. Shop around. No one place has the lowest prices on everything. Sure, this takes a little extra time, but you can save $1,000 in one day just by comparing prices. [Not bad. That works out to $125/hr. for an 8 hour day.] And, these suggestions are just the low hanging fruit that come to mind. Please read through our websites with hundreds of examples and learn how you can save many thousands of dollars more with pallets, roundwood braces, dented close-out specials, etc, etc. And just to be clear, we’re not talking nickels and dimes here. More like tens of thousands of dollars. For instance, you can find building materials at yard sales and Craigslist at 10% of retail. Building codes in cities can add many thousands of dollars over rural areas with few or no codes. Wood from forests is almost free (usually available with a low cost firewood permit). An earthbag foundation can cost thousands less than concrete. Earthwork with heavy machinery could add thousands versus choosing a site that doesn’t need extra work. As the saying goes, it pays to plan, plan and plan some more. For every item on the building list there are low, medium and high cost alternatives. Some things may be free. The choice is yours. But if I had to pick a low price range for what it might cost to build the shell of the Open Source Ecology plan I would guesstimate around $10,000 – $20,000 minimum. Update: Be sure to read the comments below. Jay explains how you can get free materials and earn money doing it. For many years I wanted to build my own home with either earth or timber. Part of my problems were of course money. I didn’t have much early on in my life and now that the money isn’t as much of the problem age has caught up with me. I simply don’t have the ‘oomph’ left in my legs and back so the same work I once could do with ease would now be nearly impossible. I guess the Mrs. and myself probably should have been a bit busier making young helpers back when we still could. I still have a son and grandson who would probably be more than willing to help, but they have lives to live and happen to live too far away for it to be worth the bother. I’m pretty sure I’m not alone in getting old. A few of you will also give it a shot. Newly weds and father in law building an earthbag house In easteren Canada hope the insulation works! !any tips? We have numerous free articles on this blog and our main site at Earthbag Building.com about insulated earthbag houses/building in cold climates. The fastest, simplest method is to attach rigid foam insulation to the exterior. Then you can plaster or add siding. Open source ecology? – isn’t that how it all started off before all this modern day, mass produced world we now live in? Think out of the box. If you need it just build it or look for materials that will assist you in the putting it together. Easy to say, but hey it’s far from impossible considering our ancestors managed to get it done! Like a few of you, I have a friend who lives off the land and he has achieved nothing sort of miracles when he has found solutions to his problems. When most of us would just take off to the nearest hardware store for the solution, ole Barney would take a look around and build,the solution from existing material just hanging around the yard. Amazing. “We survived without technology for 1000’s of years and we just get lazy…” Great attitude and very right I hate to say. Me, well I’ll just remain lazy like the majority but these guys have a point. Most people’s troubles with this kind of construction comes not from laziness, but the Government. Permits and strict codes make it impossible for anyone to build a cheap structure just about everywhere. Even in the boonies you break the law… you simply get away with it due to a lack of enforcement. There are even states that limit min square footage to keep out tiny dwellings, or make it illegal to even camp on your own land. No one “owns” property in this country. It’s simply rented from the state, which owns it all. Guns are the only thing that keeps a man truely free, and the government has made damn sure to have more of them along with mercenaries willing to actually shoot then. Absolutely true. Hard to be “free” at all these days. In response to your remarks on guns. My pitiful legal AR is no match for anything the government owns and is willing to use. In fact my 30-30 is a deadlier round than the 223 but slower to operate. My name is Caroline and I live in Canada. I am slowly but surely planning to build my own house. So far, I am interested in building the custum crow (with 3 bedrooms) but without the loft and cathedral ceiling. I would like a simple rectangular roof that is higher in the front than in the back, making it easier to harvest water. 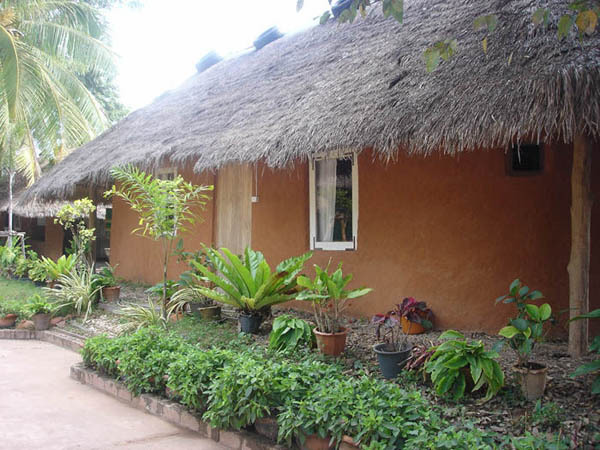 I am nowhere near calculating all the exact price of such an endeavour, but I was wondering if you could lead me towards a price range: more towards 30 000$ or 100 000$ for building such an earthbag house, with electricity, probably running water but no municipal sewage link (compost toilet)? I would probably use post and beam, straw bale infill and scoria filled earthbag foundations in cold climates. This would give you maximum insulation and speed and ease of construction. Trying to estimate the cost is a can of worms as I point out in this article. The number one factor is codes. While you could build this house for $30,000, codes could drive the cost to $100,000. That’s why I often urge people to move to rural areas with few or no codes. I have a question that sort of pertains to cost, in that I am trying to calculate the cost myself. I have been doing calculations as to how far a ton of earth will go when filling the 17″x30″ bags. I have finally come up with around 200 bags. There are so many different variables such as density of the fill, the other materials mixed in etc, that it makes it quite difficult to ascertain the exact weight of the ten gallons of dirt that is put into each bag. Is my calculation anywhere near the correct numbers? Thank you ever so much for all that you have done to further everyone’s knowledge on this subject. We use 18″x30″ bags. That’s the standard size most people use. We use four 2-gallon buckets of soil to fill the bags. The buckets we use are called cement buckets, because they’re used to carry cement. Five gallon buckets filled with moist soil are too large and heavy to carry around unless you’re a linebacker or something. 1. Calculate the soil needed by determining the volume of the walls. Want to build a roundhouse? Use the volume of a cylinder formula. Want to build a rectangular structure? use the volume of a rectangle formula. You can find these on the Internet if you don’t already know. 2. Find out what units are common used by trucking companies, excavation companies and gravel yards in your area. They may used cubic yards, cubic meters, ton, doesn’t matter. 3. Convert the cubic feet (calculated above) to the desired units. Let’s say local companies sell soil by the cubic yard. Type “convert cubic feet to cubic yards” in a search engine. Enter the first value (1,414 cubic feet) in the online calculator and you should get 52 cubic yards. 4. Optional: determine how many tons of soil you need. Many companies sell by the ton because it’s easy to weigh the trucks. To determine the number of tons needed you’ll first need to know the weight of the soil. Clay subsoil is heavier than topsoil. Search online to find the approximate weight per cubic yard, or cubic foot and convert the units as necessary. Then you can plug this information into an online calculator that converts cubic yards to tons. It’s a shame not many people know even the most basic of skills anymore. I wish I had someone to teach me the skills you would pass down Jay. Although we are lucky to have this fancy online thing so you can learn how to do almost anything. I really got excited about the earthbag houses a few weeks ago when my girlfriend was showing me a picture of one. That night I read a ton of information on the process and materials needed, but got discouraged because I have no money to do this yet. I just saw this post today and it defiantly gave me inspiration to not let that stop me and to step outside of the box. I have access to land if I had the materials, so looks like it will be a slow gather of materials. The feeling to have built your own home must be amazing, I’m itching to get started. Oh I know that’s exactly what i have been wanting to do. Actually instructables is where I first found these amazing houses. I found a couple that is doing a earthbag wall for their homestead in Seattle. When I get some time in the following weeks I plan to contact them about volunteering for that hands on experience! That’s the best way to learn. Help someone for even one day and you’ll learn almost everything if you rotate through the various tasks and ask questions. Then when you read the instructions they’ll make more sense. Note the warehouse full of recycled materials in the video above. They probably got paid to demolish or deconstruct the houses and now they have a huge inventory. If someone is even more creative, it is possible to EARN MONEY by acquiring building materials for your house. Does someone have a structure they are willing to pay to have torn down? Earn some money while carefully deconstructing the building to salvage building materials you can then use to build your home. Need earthbags? Get a job at a business that uses a lot of grain or feed bags. Earn money while collecting the used bags. Get creative and always be on the lookout for extra opportunities. I once got paid $1650 working only evenings and weekends to clean up after a construction crew each night at a neighbor’s house. I scored huge. I reclaimed hundreds of dollars worth of used brick. Perhaps over a thousand dollars of intricate wood trim and used hardwood flooring. I even made money by reselling the old wiring to the scrap metal yard. When the roofers removed the old roof, I collected 50lbs of used nails with a magnet and got a few bucks extra for the scrap metal. The homeowner was ecstatic because I kept the site impeccably neat, tidy, and organized. The contractor loved having a much safer and cleaner work environment. The skilled tradesmen loved that they didn’t have to waste their valuable time doing the drudgery of cleaning up. Everybody won. Rule of thumb… look around for business or individuals that work with the most expensive components in your design, and then try to get a job working for them. Make use of their waste, scrap, units with minor cosmetic errors, etc. Using the basic principles promoted on this website along with relentless hard work and creativity, it is possible to actually make money by collecting materials to build your own home. This path most certainly is not for everyone. It won’t be easy or fast, but I’m convinced it is possible. The age old adage applies: You can have it Good, Fast, Cheap… Pick exactly two. Just remember, whichever two you pick, it will be impossible to get the third. Excellent suggestions, Jay. It’s comments like yours that bring life to this blog. Thanks for sharing. This reminds me of a demo job we helped on many moons ago. Instead of paying cash for our labor, the contractor gave us a portion of the lumber from the old warehouse we helped tear down. It was a lot of work (huge understatement), but we got enough super strong Douglas fir lumber to build a house for nearly free. No doubt the contractor saved on paperwork, fees, etc. Plus, the job got done much smoother and faster. This type of work is rather dangerous though. Be sure to wear good boots to reduce risk of stepping on nails. Have a first aid kit handy, etc. The only thing I can add is to check local regulations before demolishing buildings. This usually requires a permit, special license and insurance to be legal. That’s another reason to live in rural areas with few codes. Out in the country it’s likely no problem to do this without jumping through endless bureaucratic hoops. And make sure you have a covered place to store the wood so it doesn’t rot. Another angle is to work with contractors in trade for materials. They’re going to haul everything to the dump anyway. They might let you work at night on the sly with LED headlamps. The 5-10 truckloads you remove will reduce work for the contractor. This can turn into a small gold mind of opportunity. Getting a job as a laborer for Landscape contractors is a great way to score a lot of rock, brick, block, gravel, sand, and other materials. Often landscapers won’t take the time to reuse old materials, such as gravel or sand. Not to mention the tons and tons of urbanite. For that matter, if someone were to build a Jaw Crusher, you could really get after the urbanite and create a valuable gravel base. On another topic, I think it would be great if someone came up with a DIY design that people cleaning up the aftermath of earthquakes could use to build their own. People could use them to clear debris, and in clearing that debris, they could create a valuable building material to rebuild. They need not be expensive, just need a small engine, a bunch of strong steel, a couple of pulleys, a slightly eccentric cam shaft, and a welder. Almost all the parts should be available in salvage yards if one is creative and can adapt to what is available. Great. Keep the ideas coming Jay. A lot of concrete turns into small rubble in violent earthquakes. Just screen out the big chunks and you’ll have all you need to build lots of houses. Note: Concrete in developed countries is much stronger and far less likely to pulverize because it’s usually higher quality (more cement, less water, better mixing and curing). Also note, working for multiple companies doing different jobs as Jay is suggesting is a great introduction to construction. That’s what I did when I was young. I’d learn a skill and move onto something else. I’d love to see an ebook using these basic ideas. Example: Someone like Jay could document his experiences over a few years working at different jobs that are chosen so as to obtain the necessary materials to build a house for free AND get paid for it. My Grandfather is the one that should have written a book. That man could build anything. Amazingly, he could adapt and change his designs on the fly as he happened to discover free or cheap materials to use. I watched him build a hydraulic lift cylinder out of a couple of pieces of rusty steel pipe, a few fittings and a power steering pump out of an old Buick, and some leather seals cut out of the seat covers of that same Buick. The leather made the hydraulic lift cylinder seals. When I saw that cylinder lift about 8 tons, with no leaks, I realized my Gramps could do anything. I was in awe. He could do the same kinds of things in building structures. Of course whenever the job required hours and hours of work with a shovel or hauling buckets of heavy stuff by hand, it was me that he called upon. He always chuckled when he gave me those jobs. Ugh. My back and knees ache today just thinking about it. I learned a great deal helping him on his farm. I really miss him. Sadly, I don’t have a Grandson to pass along those lessons… (tortures? )… to. I guess I’ll just whine about it on the interenet. Heh heh.